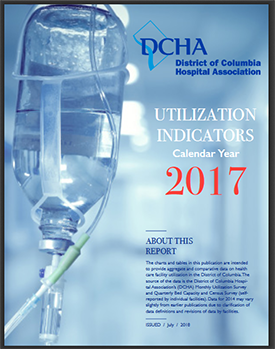 DCHA Utilization Indicators Report provides aggregate and comparative data on health-care facility utilization in the District of Columbia. Data reported includes number of ambulatory surguries performed, emergency department visits, inpatient admissions & patient days, pyschiatric admissions, rehabilitation admissions, skilled nursing facility admissions, neonatal admissions and newborn admissions. Report is available in PDF format only.